Koror, Palau, March 23 (CNA) The presidents of Taiwan and Palau watched a joint rescue drill on the seas close to Palau on Saturday after the two countries signed an agreement the previous day to cooperate in sea patrols. During the drill, Taiwan's 1,800-tonne "Hsun Hu No. 7" patrol frigate was informed by Palau fishing boat "London" that two of its fishermen were missing, presumably falling into the sea. Taiwan President Tsai Ing-wen (蔡英文) and her Palau counterpart Tommy E. Remengesau, Jr. watched the drill through telescopes and were briefed on the situation, in which the patrol frigate reached the fishing boat, released lifeboats, and rescued the fishermen. The drill was the first of its kind between Taiwan and Palau, according to Coast Guard Administration (CGA) Fleet Branch head Hsieh Ching-chin (謝慶欽), a member of Tsai's entourage. Under the sea patrol cooperation accord, the two countries will join hands to fight cross-border maritime crime and protect each other's fishing boats, said CGA Director-General Chen Guo-en (陳國恩). Taiwanese patrol boats will also be able to dock in Palau to supplement their supplies during missions on the high seas, Chen said, and the two nations will also conduct training and exchanges of sea patrol personnel in the future. After the patrol, Tsai took a boat operated by Remengesau himself to the popular tourist destinations Nikko Bay and Dolphin Bay to see how Palau develops tourism without sacrificing its natural environment. Following the cruise, Tsai wrote on her Facebook page that the Palau experience was worth emulating and that environmental conservation is an important task for island countries. Tsai cited Palau's implementation of the Palau Pledge in 2017, which requires visitors to sign a pledge to act in an ecologically responsible way on the island for the sake of Palau's children and future generations of Palauans. After that, Tsai visited the Airai Bai, a men's meetinghouse where women need special permission to enter, making her the first foreign female head of state to be allowed into the historic building in the Airai municipality on Babeldaob, the largest island of Palau. An invitation was extended to Tsai with the agreement of traditional chiefs in Airai. The president later also witnessed a ceremony in which representatives of Taiwan's Shin Kong Wu Ho-Su Memorial Hospital donated medical instruments to Belau National Hospital. Tsai will leave Palau on Sunday morning and head to Nauru, before arriving in the Marshall Islands on Tuesday to attend the first Pacific Women Leaders' Coalition Conference. 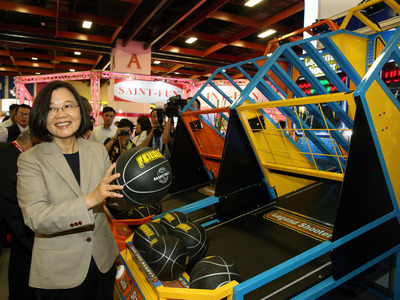 This is Tsai's sixth overseas trip since taking office in May 2016. The three Pacific nations are among Taiwan's 17 diplomatic allies.